Gulf coast resident Ralph Fuller was the first UFO witness in 1988 to capture a UFO on tape. He was often outdoors, and frequently watched the Atlantic ocean and the sky above it. Although he had seen just about everything that flew in the skies near his home, what he saw one day was quite different. At first, he saw only one unidentified object in the sky. "I don't know what that is out there over the Gulf, just a real bright light. I think it may be a flying saucer." Then there were two, three, and more. It was like one was making duplicates of itself. After a few minutes of time, there was a total of ten UFOs as seen on his video. The objects seemed to say in formation. Each individual object was linked to the whole. 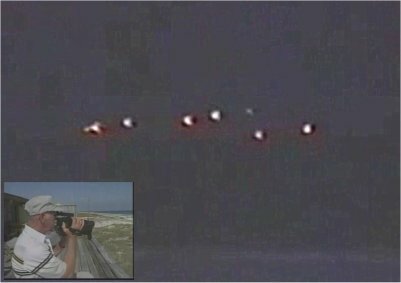 As Fuller watched and videotaped the display over the Gulf of Mexico, he could hear no sound coming from the formation. Fuller often watched the Gulf, and was familiar with practically all planes and boats that appeared on a regular basis. This was during the same time frame and close to the locations of the famous Gulf Breeze Sightings. On this particular day, however, he could see none of the usual ships or planes, only the UFO formation. To this day, he has no explanation as to what the objects may have been.